Hey, thanks for all the encouragement you guys. It feels really good. I felt way better after hanging with Grammie all day. But how come there is no good TV even with the Dish? Curses. It's a mad house around here this week with my crazy overtime working husband, but we are hanging in there. Fortunately, I have taken on a research project with Mariko involving a new (to us) bakery with supposedly the most amazing $.68 cupcakes ever. I will report back after we have the results, don't you worry. 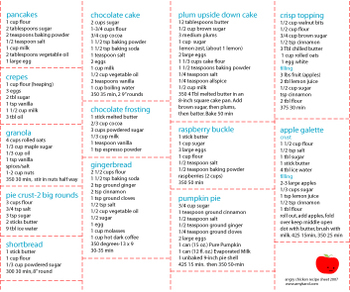 This is a recipe cheat sheet I made over the weekend. The side of the fridge was getting out of control. The scene was bad--post-its and taped up cards held by horrible lame magnets, swearing. . .all this for things like a simple pancake recipe (the aforementioned fairy cakes, actually.) I had all my favorite recipes handwritten on random bits of paper all over the fridge and anytime a magnet fell so did a crucial recipe, landing in dust bunny land between the fridge and the counter never to be seen again. No more, I say! These recipes are from various sources, some from Everyday Food, some from the sides of cans that get recycled, the rest I don't even remember where they are from but when I need them, I need them fast and don't want to dig. I have already thanked myself a million times for doing this and it's only been 4 days. It's so much cleaner there now, less visually horrible, and if the sheet falls or gets thrashed, I can just print another. Oh, look out! I could even laminate it. Crazy, I tell you! On the list is: pancakes, crepes, granola, pie crust, shortbread, chocolate cake, chocolate frosting, gingerbread, plum upside down cake, raspberry buckle, pumpkin pie, apple crisp, apple galette. So, it is here. if you are interested. It is a PDF of the file. Enjoy! ***Disclaimer. There are no directions, just ingredients and cooking times. So. . .you are on your own for that. I am cramming a ton in space-wise and since I know these recipes well, I don't need to be reminded how to make them, just of the ingredients. I hope this isn't horribly annoying. The one thing I will say is add the hot coffee/water last in the cakes and the apple galette looks like this. Besides that, it's just basic baking. Also, I substitute and reduce fat/sugar a lot, and these quantities have not been reduced. I like to keep the original amounts listed so I know where I started from.